Tired of just surviving day to day life with little or nothing to show? Tired of marking off the same 10 items on your to do list only to feel like you should have accomplished 100 more? Say Goodbye to Survival Mode is the book for you. Ms. Paine provides practical direction in setting and maintaining priorities. In a world that is set to do more, have more, be more, we get lost in busyness and that busyness affects lives, marriages, childhoods and futures. A favorite quote from the book: “I’d rather do a few things well, have my priorities in order, and enjoy life than to try and do two hundred things poorly and have a stressed-out, exhausted, passionless existence.” (Loc164). That pretty much sums up the point of this book. 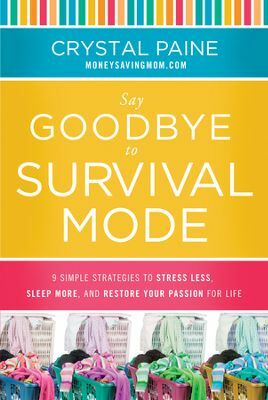 Say Goodbye to Survival Mode is a great book for women of all ages. I enjoyed the book and would highly recommend it. I received this book from Netgalley and Thomas Nelson Books in exchange for my honest opinion which I’ve provided here.